Most people were pretty surprised when Pope Benedict XVI announced his retirement. I remember when he first called me to ask my advice… ok, just kidding, I was as surprised as everyone else. He almost never calls me. My point here is to show you an image – something I’ve been thinking about lately, with regard to the Pope and the Papacy. In the basilica of St. Peter’s in Rome, behind the main altar, there is a stunning sculpture combined with a stained glass window. 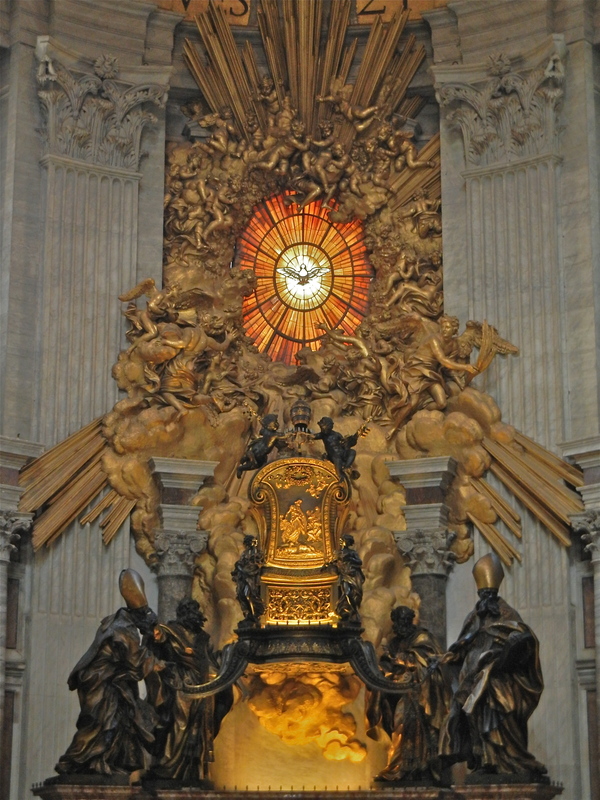 It’s the Chair (or Throne) of St. Peter. 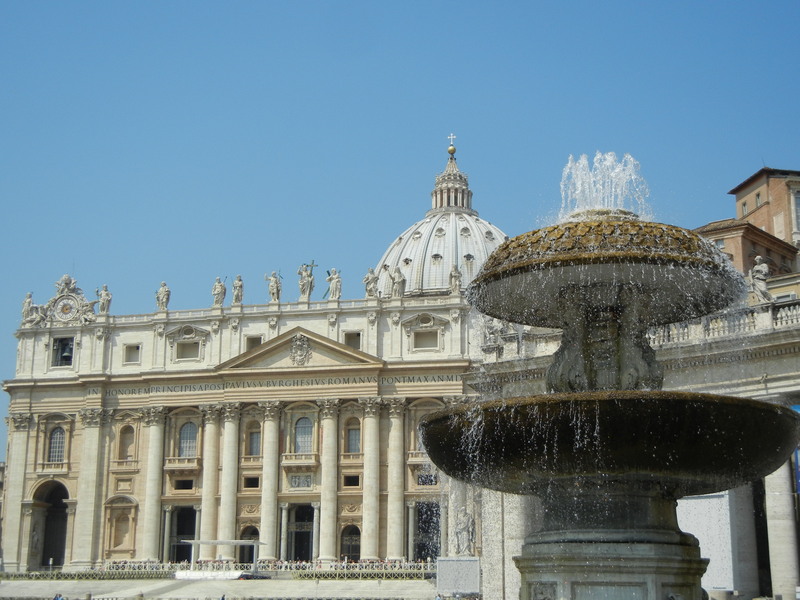 In the middle is a throne, representing the “seat” of Papal authority. Notice the four bronze bishop-looking guys holding up the chair. These are the doctors of the church – the church “fathers” who contributed to giving us our Tradition (including doctrine) as Christians. Behind the chair is the Holy Spirit window. So the authority of the Pope is depicted as supported by Tradition and inspired by the Holy Spirit. In a way, that could apply to all of us. We stand on the shoulders of the great cloud of witnesses who have come before us (Hebrews 12:1, with a little Aquinas thrown in). And we are inspired by the Holy Spirit, through Scripture, through the Church, and through each other. But we also need to recognize our limitations, and in this, the Holy Father has given us a great example. I don’t know about you, but I’m pretty good at pushing myself to the limit. Over-scheduling myself and testing my own boundaries. Sometimes I get to a point where I realize I just can’t do any more. Last week, there was no blog because I was trying to take my own advice and slow down a bit. Since I’m very goal-oriented, I often need to be reminded that life is not in the achievement of goals, but in the daily walk – and as long as you’re moving in the right direction, it might not matter how fast you’re going. In any case, anxiety over the speed of our forward movement often only distracts us from the truly important things in life, like relationships. All this is in my book, Spiritual Blueprint. I wrote that book – so you’d think I wouldn’t need to be reminded of what I wrote about. But I do. We humans have such an ability to know something, but compartmentalize that knowledge away from our actions, and not let our behavior be affected by what we know is true. All that is to say, we need constant reality checks – reminders that the pilgrimage is as much about the journey as it is about the destination. And there’s nothing wrong with enjoying the journey. There’s a song I wrote that is meant to capture this idea. It’s called Be My Strength. Here’s a video of a live performance of the song at a Christian coffeehouse. That’s me with my band Remember Rome. The studio version of the song is on my new CD, Still Quiet Voice. We thank you oh God, for the saints of all ages. For those who in times of darkness kept the lamp of faith burning. For the great souls who saw visions of larger truth and dared to declare it. For the multitude of quiet and gracious souls whose presence has purified and sanctified the world. And for those known and loved by us, who have passed from this earthly fellowship into the fuller light of life with you. [Take a moment to thank God for those loved ones who have passed on to eternal life.] May we, who aspire to have part in their joy, be filled with the Spirit that blessed their lives, so that, having shared their faith on earth, we may also know their peace in your kingdom. Accept this, our thanksgiving, through Jesus Christ, to whom be praise and dominion forever. Amen. This entry was tagged Benedict, Chair of St. Peter, Papacy, Papal election, Pope, resignation. Bookmark the permalink.